In Their Words: Obama, Boehner On Taxes : The Two-Way While the president makes the case that reform means millionaires shouldn't pay at lower rates than those in the middle class, the House speaker says "tax increases destroy jobs." 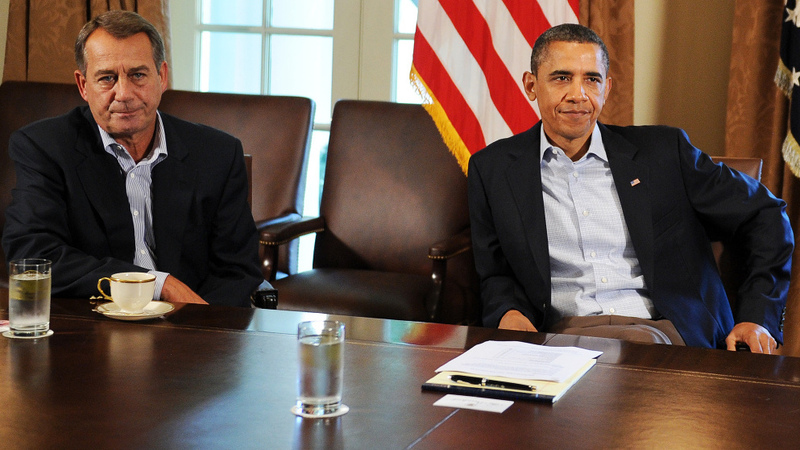 Far apart: House Speaker John Boehner (R-OH) and President Obama in July. For comparison purposes, here's a look at the latest words about taxes from President Obama (D) and House Speaker John Boehner (R-OH). As NPR's Mara Liasson said earlier, "yes, we're at a stalemate." "1. Lower tax rates. The tax system should be simplified and work for all Americans with lower individual and corporate tax rates and fewer brackets. "2. Cut Inefficient and Unfair Tax Breaks. Cut tax breaks that are inefficient, unfair, or both so that the American people and businesses spend less time and less money each year filing taxes and cannot avoid their responsibility by gaming the system. "3. Cut the deficit. Cut the deficit by $1.5 trillion over the next decade through tax reform, including the expiration of tax cuts for single taxpayers making over $200,000 and married couples making over $250,000. "4. Increase job creation and growth in the United States. Make America stronger at home and more competitive globally by increasing the incentive to work and invest in the United States. "5. Observe the Buffett Rule. No household making over $1 million annually should pay a smaller share of its income in taxes than middle-class families pay. As Warren Buffett has pointed out, his effective tax rate is lower than his secretary's. No householdmaking over $1 million annually should pay a smaller share of its income in taxes than middle-class families pay. This rule will be achieved as part of an overall reform that increases the progressivity of the tax code." "It's probably not realistic to think the Joint Committee could rewrite the tax code by November 23. But it can certainly lay the groundwork by then for tax reform in the future that will enhance the environment for economic growth. "The Committee can develop principles for broad-based tax reform that will lower rates for individuals and corporations while closing deductions, credits, and special carveouts in our tax code. And I hope it will. "Yes, tax reform should include closing loopholes. Not for purposes of bringing more money to the government. But because it's the right thing to do. "And if we're going to tackle tax reform, we should do it all. "Making short-term fixes in exchange for long-term flawed policy is not tax reform. "Tax reform should deal with the whole tax code, both the personal side and the corporate side, and it should result in a code that is simpler and fairer to everyone. "Tax increases, however, are not a viable option for the Joint Committee. "It's a very simple equation. Tax increases destroy jobs. And the Joint Committee is a jobs committee. Its mission is to reduce the deficit that is threatening job creation in our country."